So, tonight while getting dressed to play racquetball with K...I noticed a new muscle (or part of one) that I've never seen before...ever! It was very exciting. I've been lifting weights 3 times a week for several weeks now and I'm finally starting to see a difference. Of course, I'm just a beginner and I can't lift much at all...but it's a start. See, muscle burns more calories than fat so the more muscle you have, the more you can eat. And no one loves eating more than I do! In other news, the weather here has been beautifully snowy lately. The dry kind of powdery snow that is wonderful to ski on. I hope to get out there skiing tomorrow after attending the first day of the Alaska Library Association's annual conference which is being held in Juneau this year. Normally I'd be presenting something at it, or volunteering in some way...but I admit I've gotten a bit stingy with my time. Still, I will be attending Fri-Sun and I'm looking forward to hooking up with all my librarian friends from around the state. We're a lot crazier than you'd imagine; being a research librarian is the coolest job ever! Have you hugged a librarian today??? 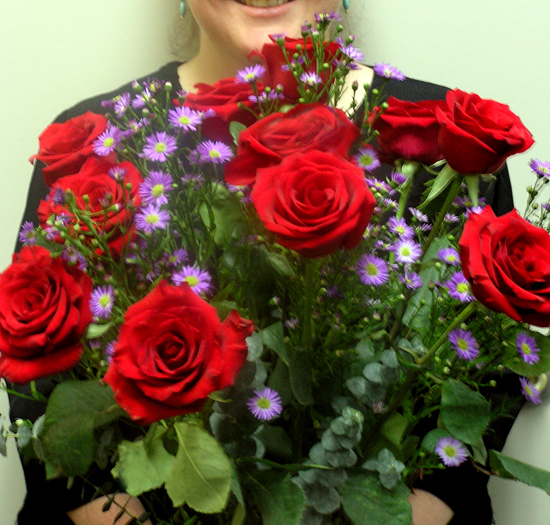 Here is a photo of me holding the beautiful bouquet of roses that Aaron had sent to me at the library for Valentines Day. A long time back when he was planning his trip he let me know he'd be gone on Valentines Day and would that be a problem. I said no, that the only thing Valentines Day was good for was getting something big delivered to you at work so your co-workers would be jealous. (I was only partly joking). Well, he took me out to a fancy restaurant the Saturday before to celebrate (I almost said "our VD" but that doesn't sound quite right!) I had forgotten all about that comment but sure enough, he had this huge bouquet sent to me at work which was a complete surprise. People were coming into my office all day commenting on how gorgeous they were. I *never* get flowers delivered to me so this was a pretty big deal and had me smiling (all week) actually. I finally took them home over the weekend but they still look amazing. So, our resident black wolf Romeo is back in the news. For those of you who never heard back, the DNA results of that other black wolf that was killed turned out not to be Romeo and two people were arrested in conjunction with his death. The real Romeo is back out near the Mendenhall Glacier and it's sparking a huge controversy here in Juneau. Some people think that he should be killed before he attacks another small dog or maybe even a child. Others (including me) think that people should respect the space of wild animals and keep their pets on a leash (as is the city ordinance) and keep their small children away from the area when Romeo is about...not let their dogs play with him and get up as close as possible to pet and take photos. He's a WILD animal people! Here is a discussion on the Juneau Empire's blog on the issue...over 71 comments so far, and counting.